Dimensions (HxWxD): 1.2" x 1" x 0.33"
This lovely rich silver-blue-violet colored Angel Aura Flower of Life pendant is a very powerful piece offering protection and beauty to the one who wears it. 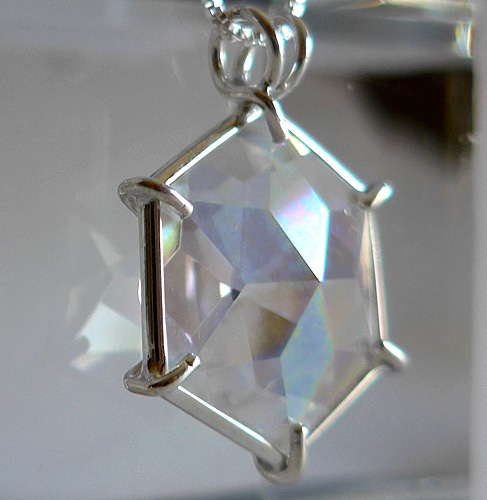 It is a polished & cut stone, an exceptionally clear 12 pointed star set into a sterling silver setting which allows the stone to breath, and hangs on its sterling silver chain right on the thymus between the throat and the heart chakras, offering protection to the whole body resonating through the compassionate heart. 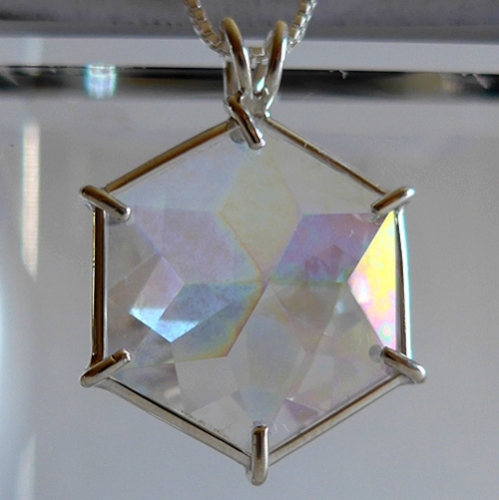 This crystal pendant has been cleaned with Universal Life Force Energy, and given an energy attunement using Reiki,a Japanese technique of energy healing, so it will continue to receive and transmit Universal Life Force Energy direct from the Source of Creation. It is ready for you to program according to your own needs and desires. We know you will use this powerful crystal pendant with loving wisdom and respect its long journey in the Earth that has lasted for many long historical cycles. 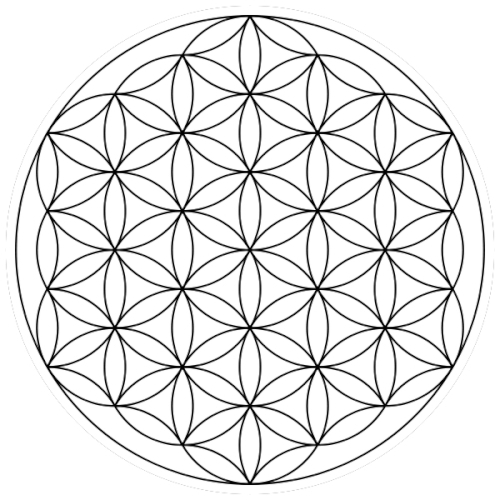 This crystal is a powerful tool, a love-gift from the Divine Mother to you. Note: Weight above is shipping weight. Actual weight is .25 oz. Each piece is unique and may vary slightly in appearance and color. Each piece is guaranteed to be beautiful and to meet with your complete satisfaction!